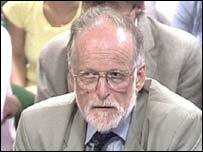 The late weapons expert Dr David Kelly said it would take Iraq "days or weeks" to deploy weapons of mass destruction. His view, at odds with the claim Iraq could launch weapons in 45 minutes, is in a previously unbroadcast interview shown in a BBC Panorama special. Panorama disputes a BBC report that No 10 ordered intelligence chiefs to add things to the Iraq weapons dossier. It also hears from an ex-intelligence boss who fears his successors were part of Tony Blair's "magic circle". Dr Kelly apparently committed suicide after being named as the suspected source for a BBC story on claims Downing Street "sexed up" the government's Iraq weapons dossier. Lord Hutton's report following his inquiry into Dr Kelly's death will be published next week. The interview with Dr Kelly was recorded for Panorama in October 2002, a month after the prime minister presented the dossier to Parliament, but never broadcast. He also said Saddam Hussein's biological weapons programme posed a "real threat" to neighbouring countries. Dr Kelly was publicly generally supportive of the Blair government's tough stance on Iraq in the interview, which was submitted to the Hutton inquiry. But he says Saddam Hussein would probably be reluctant to use weapons of mass destruction unless attacked first. BBC Today programme defence correspondent Andrew Gilligan reported his source as saying No 10 had known the 45-minute claim was questionable when it was put in the dossier. But at the inquiry into Dr Kelly's death, he apologised for saying his source had told him it was known it was "probably wrong". The Panorama programme said Mr Gilligan was "on to something" but it "was wrong to say anyone in No 10 ordered the intelligence services to put anything into the dossier" and far less any material it knew was probably wrong. It also said BBC executives who stood by the reporter without checking his original notes "bet the farm on a shaky foundation". BBC correspondent Nicholas Witchell said the programme made "very uncomfortable" viewing for the BBC. "What the BBC will be hoping is that the best way to demonstrate the strength, and it would say the integrity, of its journalism, is to be seen to be reporting very robustly, very fully and very candidly, on a story which does in some respects reflect badly on it," he told BBC News at 10. Former Joint Intelligence Committee (JIC) chairman Sir Rodric Braithwaite told the programme it looked like the current committee had become involved in rallying the public around the pre-war stance against Iraq. He said the JIC's job was to analyse material. "You have to avoid getting into the magic circle which surrounds any prime minister," he said. Sir Rodric said it was difficult to resist such dangers "and from time to time it fails, you get people who should be dispassionate becoming passionately involved in things". Ahead of Wednesday evening's broadcast, Mr Blair was challenged about Iraq's weapons of mass destruction by Liberal Democrat leader Charles Kennedy in prime minister's questions. "There can be no doubt at all that these weapons existed...," he told MPs. The Iraq Survey Group was continuing its search for the weapons, the programmes behind them and how they were hidden, he added. "None of the major parties emerges with much credit"